With Home Picture Framing Intensive you will be making professional frames in no time even if you have never cut a piece of timber in your life before. Start your journey today towards improving your home and lifestyle with your new found skills. Your family and friends will be astounded with the beautiful pictures you make. Hi, my name is David Schummy and I was a framing newbie once also. As a boy I was always building things with wood. I would make model cars, boats, planes. You name it I had a go at making it. I even once made a picture frame for my Mum for Mother’s Day. Dad helped me build the frame using some timber he had lying around the garage. Little did I know that my early efforts would lead me to becoming a picture framer who would build a frame every hour of every working day and eventually lead to becoming a teacher of picture frame classes and an author of framing courses. My passion began when I had taken a gap year from studying Geology in the UK. I was walking along one of the streets near my home and I saw a picture framing job advertised in the window of a local frame shop. After I spoke to the owner and was seriously tested on my mathematics skills I was offered a job as a trainee. I wanted to succeed and was having so much fun that I went looking for more information on how to frame pictures. In those days it meant looking in the Library and local bookstores as it was long before the arrival of the Internet. It was nearly impossible to find anything that would help me become a better framer. Anyway, fast forward six years and I had immigrated to Australia and was a custom framer in a busy framing business. At this point I had become highly skilled and had been taught by several expert framers over the years. I undertook trade skills testing and became recognized as a Qualified Picture Framer. After opening my own business in 1991 I was approached by a local technical college to teach adult education classes in picture framing. There was no course outline, no learning resources and I had to devise a six week course from start to finish. My teaching career began. In 1995 the Australian Government contracted me to write 16 of the 22 modules they needed developed to train picture framers during their apprenticeships. I then piloted the first off the job college training course for framers in Australia. Over the years I refined my skills and at the same time developed better and better courses for people to learn picture framing. YOUR FAMILY AND FRIENDS WILL BE ASTOUNDED WITH THE BEAUTIFUL PICTURES YOU MAKE. My business now employs 10 staff and is recognized as a leading business in my industry. I am now proud to release a simple to follow picture framing course on DVD that will take you from picture frame newbie to a competent picture framer at home. This course although basic can shed light on many areas of picture framing that even my peers haven’t fully grasped. When you have finished the course you will have a sound understanding of the basics of picture framing but it won’t stop there. You can then progress through further online video training and instruction that is available to you via my picture framer’s masterclass membership site. When you buy my Home Picture framing Intensive you receive 3 Months free access to the membership site to allow you to try some of the techniques out. If you want to cancel you can do so at anytime but I know once you get bitten by the framing bug you will want to learn the advanced techniques like shadowbox construction or memorabilia framing techniques to name a few. The membership site is where you can find out more techniques and my secret tips to succeeding as a picture framer. Platinum membership is for those framers wishing to go into business. 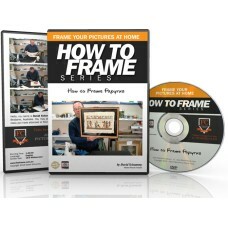 It contains years of accumulated knowledge that will catapult your skills and abilities helping you become an expert at picture framing. David taught me how to frame my own paintings about 12 years ago. It was one of the best courses I ever attended. Still regularly selling my framed art. Thanks David for passing your knowledge on..
What might you ask would years of knowledge in any industry cost to acquire. I’ve invested over $47000 of my own money in personal development in relation to my craft and business. I have researched and refined the key skills you need to get started on the journey towards rewarding yourself with the happiness picture framing will bring into your life. During the last fifteen years students have paid between $200 – 250 for group training in classes of 16 or more people. Individuals have paid me up to $6000 for one on one training and consultation to help them run their framing businesses. I now only work with private clients training them in specific skills that help them improve their bottom line. 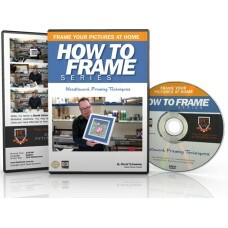 The Home Picture Framing Intensive DVD Course is worth $297 ALONE but I have made it available for a limited time at the special price of $97. I only allow 100 people into my membership site at any one time so that I can deliver the standard of service I am known for and deliver the results you deserve. 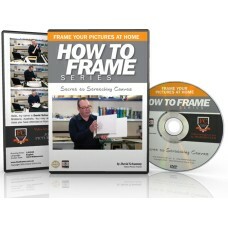 So for a limited time you can have the full training course for $97 including the membership access… …act quickly to get this great deal on Home Picture Framing Intensive because once the membership is full this offer will be removed without notice and you will wait until it re-opens. My photography club has monthly awards but you have to display your photos matted. In just 20 minutes after David's demo I had made the three mats I needed for that evening. Still regularly selling my framed art. Since then I reckon I've saved hundreds of dollars and been able to win a few prizes too!. Grandma just had her 75th Birthday and I framed her needlework she stitched as a gift. You should have seen the tears running down her face as she unwrapped it. It made me feel so proud to have made her day special. Certificate of Completion. Gain recognition and receive a certificate of completion, send photo of you holding a frame you have made and tell us what you enjoyed most about making it. 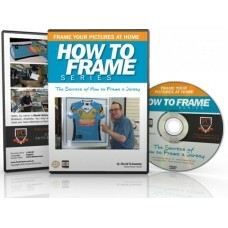 How To Frame Jerseys Framing sporting memorabilia correctly will enhance your investment and g..
How to Frame Needleworks This DVD will take you through the steps to successfully framing needlew..
Picture frame workshop workflow - essential training on DVD How to Frame Series Workflow DVD tr.. 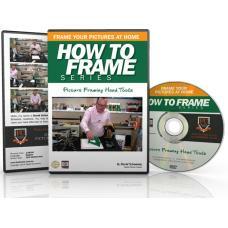 The essential tools to make picture framing easier.This is a behind the scenes training on what hand.. 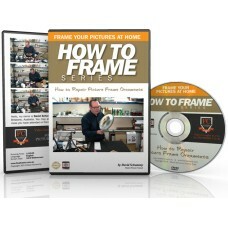 Need to repair a damaged ornamental picture frame?This DVD will take you through the steps to repair.. This DVD will take you through the steps to successfully stretch canvas paintings, photos on canva..
How to Frame a Wine Bottle Advanced Shadow Box framing techniques for objects like wine bottles, ..